Snowflake badge in lilac with a festive white snowflake design. These Snowflake badges are perfect for Christmas time and can be pinned on Christmas jumpers, Christmas stockings and onto your school uniform in December. You could also pin one to your homemade Xmas cards. 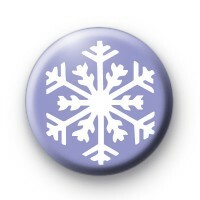 We have a range of snowflake badges available in our Christmas badge section and a whole host of other Xmas badges. All of our badges are made by hand in our UK workshop & we deliver worldwide.